The Manalapan Braves Travel Baseball program will hold tryouts for the 2019 season on the dates listed below. PLEASE CLICK HERE TO DOWNLOAD THE TRYOUT CONSENT FORM. PLEASE BRING THIS FORM TO TRYOUTS. 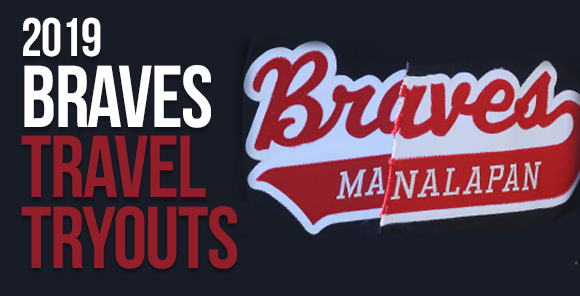 Existing travel players should not wear any BRAVES apparel during the tryouts. There will be a non-refundable deposit of $350 payable to MBSA Travel required at the tryout which confirms your commitment to the Braves Travel Program. Any player not rostered will receive back their deposit. Parents will not be allowed to stay for the tryouts. If you have any questions about tryouts or the Braves Travel Program, please email .